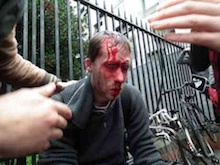 A brutal Garda attack on a student protest in Dublin which injured and traumatised protesters as young as 16 and 17 years of age has been strongly condemned. More than 25,000 people marched through Dublin city centre at lunchtime on Wednesday in protest against the introduction of new charges for third level education in the upcoming 26-County budget. The march came as the government finalised plans to introduce cuts of more than 4.5 million euro and new taxes of 1.5 million euro next year -- including the near-doubling of registration fees for third-level students. The coalition has also set an emigration target of 45,000 people to quit the 26 County state next year, as well as absurdly announcing that, as a measure to combat poverty this winter, it will distribute boxes of cheese. On Wednesday, a high-spirited demonstration against student fees faced a much different response as marchers made their way from government buildings to the Department of Finance building on Merrion Row. Gardai who formed a barrier in front of the Department of Finance building were visibly “hyped up” and intent on confrontation. A sit-down protest outside the building was brutally attacked by riot police, with some participants clubbed and dragged off the road, many by their hair. “Some people were just sitting down and when they wouldn’t move the gardai just started hitting them. One guy had a beard and they were pulling him by his beard,” said Tom Doyle, a student at Trinity College. “The police were charging and their batons were flailing and people started running away,” he added. Dozens of students were visibly injured and bleeding, and a few, both male and female, were dragged away unconscious. A number of students who entered the outer lobby of the Department of Finance, but Gardai never asked those involved to vacate the building. Supporters of Sinn Féin and eirígí were among about 50 protesters who made it inside the Finance building. “We were forcefully removed, with several people sustaining injuries and taken to hospital,” said one student. An extraordinary horseback charge was then mounted to force the demonstrators to disperse, while dogs were also set on those present. Video coverage of the clashes, posted on the internet, immediately exposed the falsehood of Garda claims to the mainstream media that the students had initiated the violence. Brian Leeson, chairperson of eirigi, said the vicious assault on peaceful protestors exposed the reality of the Twenty-Six County state’s attitude towards those who are suffering as a result of the economic crisis. There are fears that Wednesday’s aggression was intended to ‘send a message’ to Sinn Fein, trade unions, the unemployed and other groups who plan to stage further protests in advance of next month’s budget announcements. Leeson commended those who took part in Wednesday’s demo. “People should not allow themselves to be intimidated by this disgraceful use of brute force. In the run up to the Dublin government’s blood budget in December, it is imperative that tens of thousands of workers, students, unemployed people and every citizen who is being hit hard by the economic crisis takes to the streets. eirigi also slammed the media misrepresentation of the demonstration in Dublin. “Blood flowed on the streets of Dublin yesterday as a result of Garda baton charges, yet the corporate media and establishment politicians have chosen to focus solely on the actions and alleged actions of students,” it said. “What we witnessed in Dublin was the complete inability of the Garda, particularly its Public Order Unit, to deal with any form of protest that is not completely submissive. Joe Higgins, MEP of the Socialist Party, also questioned the Garda’s tactics. “The use of Garda horses and dogs against student protestors in Dublin on Wednesday is an outrageous abuse of the right to protest.